Women have a stronger preference for Mercedes-Benz sedans than men, who seem to prefer BMWs if left to their own devices. Online car dealer zigcar.net analyzed the buying patterns of Korean consumers and found that men are more drawn by promotion and discounts if they choose a luxury car, while women adore the Mercedes-Benz E class no matter what. BMW used to hold the No. 1 spot in terms of imported car sales here. The biggest variable that affected sales of foreign cars last year was the spontaneous combustions of BMWs. Sales of BMWs declined, benefiting sales of not only Mercedes-Benz but other brands like Lexus and Toyota. The top maker among women last year was Mercedes-Benz with 15,457 cars and a 29.9 percent share of the female market. Next were BMW with 15.6 percent and Toyota with nine percent. But among men BMW still ruled with 24,442 cars sold, followed by Mercedes with just 32 fewer cars. Lee Soo-yeop at Zigcar said, "In the past, Mercedes-Benz was viewed as a car favored by older men, but new models with fancy design and other top-range technical features increased the appeal among young women." 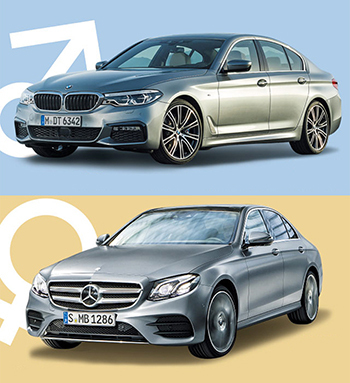 Even in the second-hand car market, men preferred BMWs and women Mercedeses. Park Hong-kyu at used car dealer SK Encar said, "Analysis of customer inquiries on our website showed men preferred the BMW 5 Series, while women favored the Mercedes-Benz E Class." Is Your Car in a Good Mood Today?